Tumblr, as you might not really know, is social media networking site that launched in February 2007. Unlike any other social networking site, Tumblr also has a great potential in various aspects but is majorly overlooked Technically, it’s a microblogging and social media website that constitutes over 130 million different blogs. Functionality wise, Tumblr is simple a hybrid of WordPress and Facebook. With a monthly view count of over 300 million users, it is also a major marketing channel, and has a lot of SEO benefits for websites. But looking for what to post there can be hard. So we have compiled for you a list of some major and extremely trending content ideas on Tumblr. Writing quotes is never really a hard step since you don’t really have to produce tem yourself. Just grab some good quote from like anywhere you want, put it in a nice frame (a suitable background) and post it on your Tumblr and get a chance to be like really popular because quotes really work great on this platform. Sharing quotes is also really a good thing to do, because of all the things, quotes have the power to change a mind the most. You in cooking rite? If that’s a yes, then you’re going to do really good on Tumblr since good cooks are really a need there. Sharing recipes on Tumblr has always worked for anyone who tried it. The community is like really fond of cooking. However, uniqueness will have its own advantages and so never forget to bring something new to the place so as to create awareness and get likeliness. You can also start thinking about starting a mini cooking show of your own provided you’re going well. Memes have taken over the internet in the past few years. Every platform you can think of is flooded with memes. Obviously, making people laugh always gets you their good remarks. Memes also work really well on Tumblr. You will see a lot of shares on a meme than you would see on a normal other note. Even when promoting your business, the use of memes can come in handy. There are over hundreds of thousands of different blogs that work entirely and solely on GIFs. Reason being their good viewership and response. Tumblr, like Google+ allows you to add GIFs. GIFs are a really popular thing on Tumblr and work really well provided they are good quality ones. Photos of all kinds grab a lot of audience especially if the word Quality is added with it. You can share the kind of photos you like and expect to get a good response on them. The kind that really work are the interesting and compelling ones which are mostly covered by the natural beauty of this world. Get a good quality camera and start picturing the world from unique angles and share these photos of yours with the Tumblr community. Several blogs on Tumblr are about famous people who did great things in their times. Not to mention, those blogs are doing some real business in the field as the community shows some real interest in this category. Getting the information about such people is also not hard as long as the internet shows connectivity. Portray the famous people and tell the readers all they need to know about them. Tumblr has over 53.5% of women on it which naturally makes it a platform where clothes are really an important matter. Sharing about the new trends and fashions can work really well here because of such a community and it actually does. Either be the model or grab the pictures of a model to get going. Who doesn’t like to visit places? Who is not inspired and amused by the immense natural beauty in this world? And, if that’s what you’re doing, who will not be interested in your blog? Places and landmarks information sharing can work really well on almost all platforms because people really want to discover this world to the extent they can. A good source of blog traffic if we just can tap on them, nice sharing of ideas bro! Hi there! I want to tell you something before spelling some lie there that yes very good nice information and bla bla! Your home page has more than 12 ads and my Alienware x51 core i7 3rd generation with 12 MB of Ram is feeling the load over there. Mind if you can under load the homepage so that i can navigate easily. you just got 12MB of ram dude, that's the whole problem. The site runs great on my Core2Duo with 2GB of ram. Try to upgrade your device so that you may navigate easily. 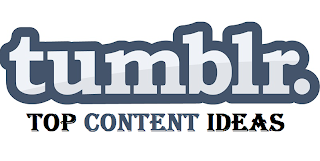 Nice share bro.. Tumbler has huge potential for SEO and social media marketing. I had created the tumblr account some months ago. But i didn't have any idea what topic should i start there. This post will help me a lot.